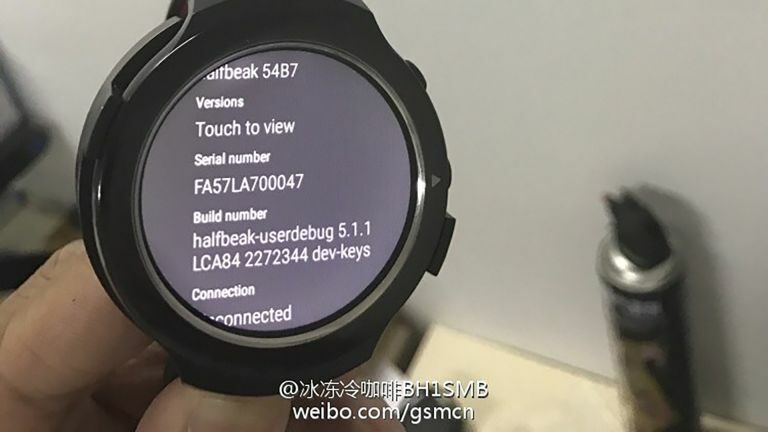 We've known since October, when the above pic materialised, that HTC is working on an Android Wear smartwatch, mysteriously dubbed Halfbeak. As the long awaited launch of Android Wear 2 approaches, scheduled for February 9, could Halfbeak be nearing completion and becoming a Wholebeak? The Upleaks blog on China's Weibo has what appear to be new pics of the watch - which has supposedly been in the works since 2015 (!) - showing it running Android Wear. Previous leaks have only featured debug screens. We're not quite sure why it's taken so long, but maybe HTC wants to differentiate the Halfbeak (named after a type of tropical fish, obviously) from the Android Wear horde, by concentrating on its fitness aspects. One of the most significant elements of Halfbeak has to be the heart rate tracker that is shown on the underside of the watch. Yes, we know many smartwatches have pulse trackers but this one is Under Armour branded, and presumably compatible with the Record app from Under Armour, which is HTC's gym buddy. Hopefully that means this watch will have GPS and onboard storage for music so it can be used as a stand-alone running watch. The latest Android Wear OS update is expected from Google on 9 February. Punctual people will also be pleased to learn that, yes, you can tell the time on Halfbeak, as this rivetingly candid snap proves.